The Ohio State Buckeyes were undefeated until they traveled to Madison, Wisconsin to play the Badgers. The Buckeyes built a 15-point lead early in the second half, but then Jordan Taylor caught fire. He was unconscious for the rest of the game and, with some help from his teammates, he led Wisconsin to victory. Losing is no big deal in college basketball. There hasn’t been a undefeated team in decades, and there is no shame in losing at Wisconsin — where the Badgers lose only once in a blue moon. But what made the loss memorable was that Jared Sullinger mentioned that he was spit upon as Wisconsin fans stormed the court and that, when Wisconsin coach Bo Ryan was asked about the incident a few days later, his message was that Wisconsin had won the game and the Buckeyes just needed to “deal with it.” Ryan’s flippant comment has been seized upon by Buckeyes’ fans as a bit of a battle cry. Ohio State hopes to “deal with it” tomorrow, when they play the Badgers at Value City Arena in the last regular-season game of the year. It should be a great atmosphere. Red “Deal With It” towels will be handed out to all of the students in the Nut House. And there will be more on the line than just working to get some payback against Wisconsin. It will be Senior Day, with Ohio State stalwarts David Lighty, Jon Diebler, and Dallas Lauderdale playing their final home games. And if the Buckeyes win, they will win the Big Ten regular season title outright. The Badgers are on a winning streak against Ohio State. In addition to their win over the no. 1 Buckeyes early this basketball season, they also beat the no. 1 Buckeyes in football. 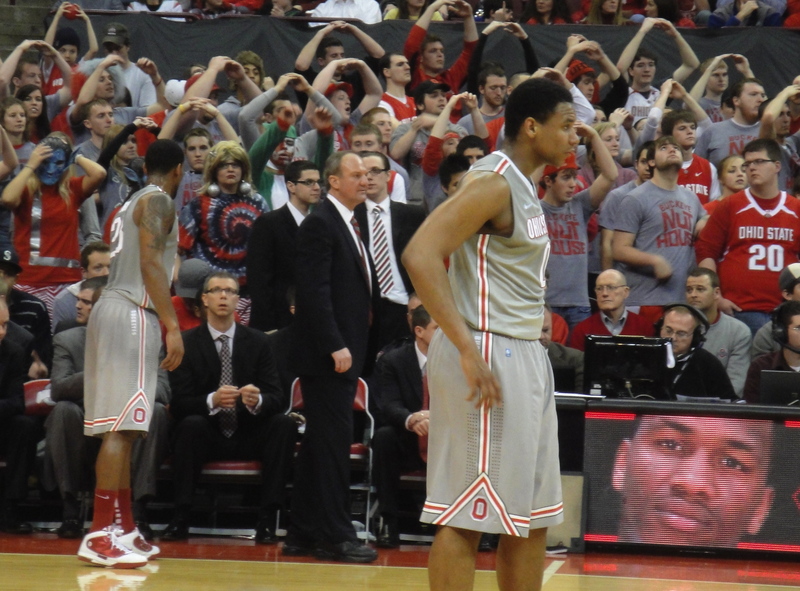 Now the basketball Buckeyes are no. 1, again. Let’s hope they turn the tables on the Badgers tomorrow. It has been raining, raining, and raining across Ohio. In Columbus, it has been raining heavily, and virtually non-stop, for more than a day. Counties across Ohio are under flood watches and flood warnings. With the constant rain, the snow melt, and the saturated ground, excess water is pouring into creeks and rivers. With amazing suddenness, the lazy, picturesque stream that you drive past on your way to work becomes a raging torrent that spills out from its bed. The widening rivers then spread across the nearby landscape, covering the area with sluggish, slow-moving brown water, and when the waters recede they leave everything thickly coated with smelly brown muck. The flooding risks are particularly acute for those to the north who live near Lake Erie, where all moving water flows to the Great Lakes basin, and those to the south who live along the many rivers that drain into the Ohio River. As more and more water flows in, from rain and smaller tributaries, rivers can rise with startling speed, trapping those who are reckless or unwary. If you want to live by a river in Ohio, you have to be prepared. Flooding is just part of life during the early spring, although some years are worse than others. The Arnold Sports Festival has returned to downtown Columbus, bigger and better than ever. It is the one weekend each year where we pencil-necked, out-of-shape downtown office workers feel like we live in an oversized world of gigantic professional wrestlers who sport bulging biceps and barrel chests under tight-fitting clothing. The Arnold, which runs through tomorrow, is a tremendous boon for Columbus and local businesses. It is estimated that visitors to The Arnold will spend more than $42 million during their stay in Columbus. It brings lots of visitors to town from all over the world, and it features events all day at five different venues in the area. Those of us who work in downtown Columbus can see the economic impact firsthand — increased car traffic, increased foot traffic, and lots of activity at hotels and restaurants. Yesterday Richard, JV and I went to have lunch at the North Market — which is one block away from the Columbus Convention Center, the hub of The Arnold — and the area was jammed with cars and Arnold attendees. As we left, we saw people lugging huge sacks of product they had purchased from the many retail stalls at The Arnold. I have to believe that, if you are a business selling fitness-related products, The Arnold is the highlight of the year. The attendees are people who are really serious about body-building, or fencing, or kick-boxing, and they will spend liberally in pursuit of their passion. We Columbusites welcome them all.